You know it's time to start thinking about Black Friday, Cyber Monday, and holiday sales when Starbucks announces their Pumpkin Spice Lattes. Each year online sales grow even bigger and, as an eCommerce business, you're probably hoping for a piece of that nearly $700 billion pie. But it's not just enough to throw up a discount on your products and hope that people find you. First there's the marketing to attract new customers. Then you need to increase conversions on your website so that they actually purchase. Finally you need to provide excellent support and not run out of inventory so that they're satisfied with their purchase and return for more. If that sounds like a lot of work, don't worry. There's an app for that! In this post we'll cover the best Shopify apps to help you make this November your best month ever. Phone calls are the fastest way to provide customer support. This is important especially during Black Friday when customers want to make purchases before a deal runs out and have questions about it. In fact, studies show that just showing a phone support number on your eCommerce store increase conversion rates. 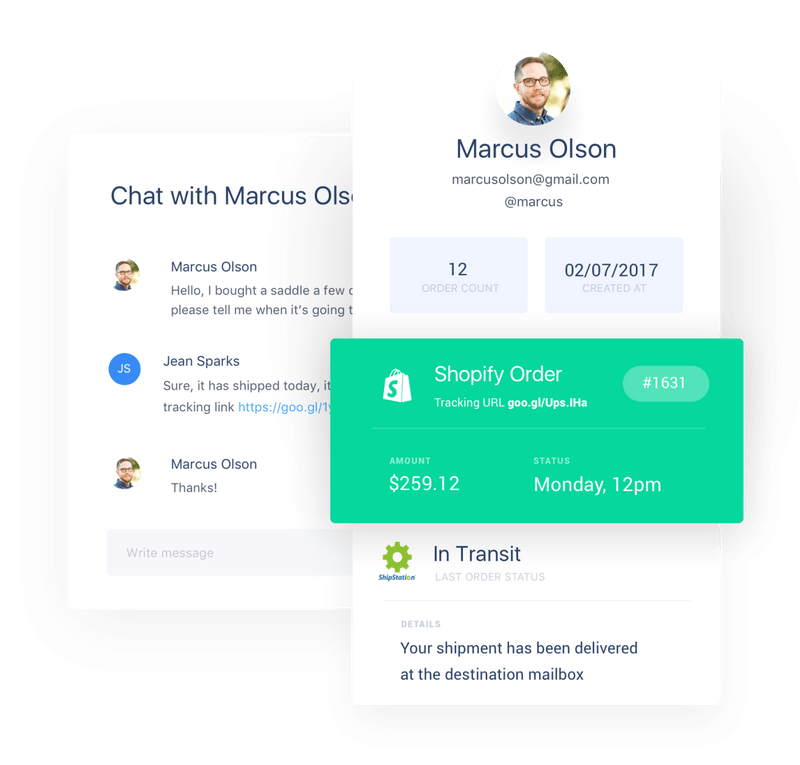 Aircall is a handy Shopify app that makes it easy to set up your phone system. It's entirely cloud-based so you don't have to purchase physical systems. And if you have a distributed or remote team, it's a no-brainer. Once you sign up, you can generate toll-free numbers for your business. These numbers are routed through the software and you can assign support staff to a phone call which they can take from a phone app. Plus, there's analytics to show you exactly how well your team are performing and if their calls turn into sales. 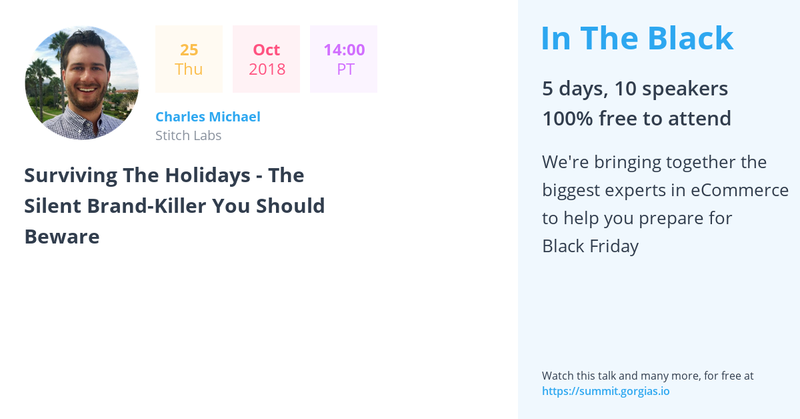 Olivia, from Aircall, will be talking about managing customer support during the holidays at In The Black, so sign up to watch her live or get the recordings. Conversion rate optimization is underrated. Most online stores focus so much on the promotion - more money on ads, more emails, more marketing! Sure you need some of that but remember that customers are getting bombarded during Black Friday. Plus, if you're discounting products, your ad spend might become ROI-negative. Here's some math to highlight this point. 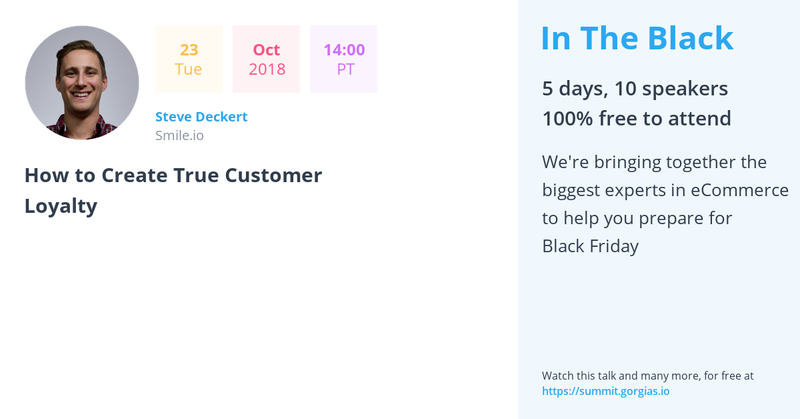 Let's say you have 1,000 visitors during Black Friday and your current conversion rate is 1%. If you sell a $100 item, that's $1,000 in sales. 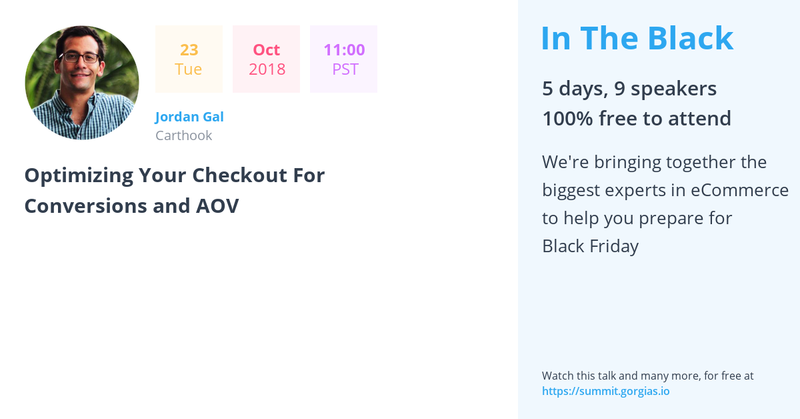 Now let's say you spend $100 on ads and, at $1 per click (you're lucky if you can get clicks for this cheap during Black Friday), that 100 additional visitors. With the same conversion rate, that's an extra $100 in sales. You broke even. However, if instead you made some minor changes to your checkout conversion rates and bumped it up from 1% to 1.1%, you've made the $100 in additional sales instantly, without any additional ad spend. These numbers are simplified but the point is that focusing on conversion rates, especially in the checkout, generates way more in sales than throwing more money into ads. And that's exactly what CartHook helps you do. 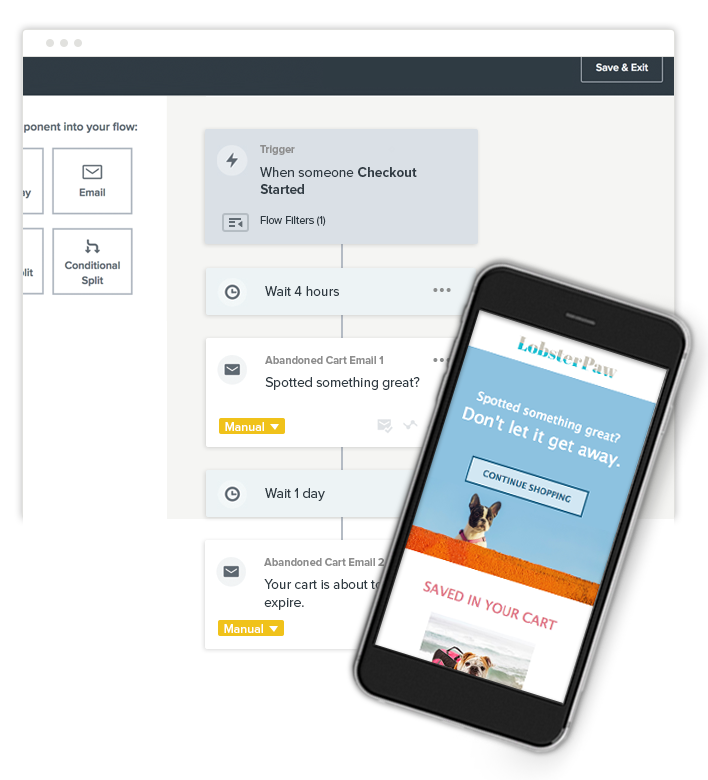 Not only can you optimize your checkout with CartHook's drag-and-drop tool, you can also add upsells to your checkout process. So instead of the average order being $100 from the above example, it could be $120 or more with an upsell. That's a huge increase in sales for very little effort. I mentioned in the last section that shoppers are going to be swamped with emails. Just look through your own personal emails to see what I mean. Mine looks like a string of "Black Friday Sale!" emails. They all look the same yet they're coming from different brands. Instead, a more personalized promotion based on your previous browsing and purchasing habits would go a long way in driving sales. Imagine if you had purchased two dresses from a store and, on Black Friday, they sent you an email letting you know that they had a pair of shoes on sale that would go well with those dresses. How much more powerful is that than a generic email inviting you to buy as much as possible on their site? Klaviyo, the best Shopify app for email marketing, takes care of this for you. It gathers data on purchase history, browsing history, engagement, and demographic information to create hyper-targeted promotions at scale. Now your emails will really stand out, leading to higher open rates, higher click-through rates, and more sales! Now that we’ve covered promotional blasts through Klaviyo — you can take it a step further using Spently, and capitalize on your most opened emails — your Shopify notification emails. These emails are sent based on specific triggers on Shopify. There are 15 in total, and include order confirmation emails, shipping updates, account welcome, etc. According to a study by Experian, transactional emails average 114.3% open rate, and a 14.4% click rate vs promotional bulk mails that average 12.5% open rate with a 3.1% click rate — that’s 10X open rate, 5X click rate, and 6X more ROI. This provides a great opportunity for you to personalize your store notifications to match your brand, facilitate engagement and more importantly drive repeat purchases using marketing components. These include, personalized product recommendations, unique discount codes, and referral components. Paired with analytics, so you can iterate with data — you can’t manage what you can’t measure. Spently makes it easy for you to customize your Shopify notifications using their builder, allowing you to leverage this captive audience’s engagement within minutes. 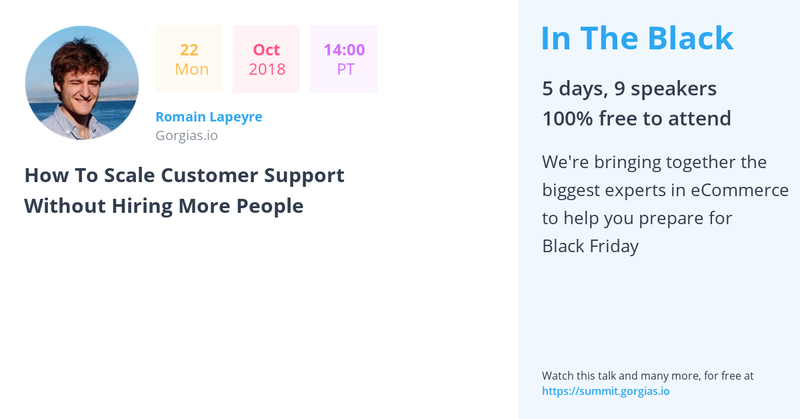 In their most recent survey on the biggest concerns for retails going into the holiday season, Shopify Plus found that 75% of respondents said providing good customer support was a big concern. The logic is simple. 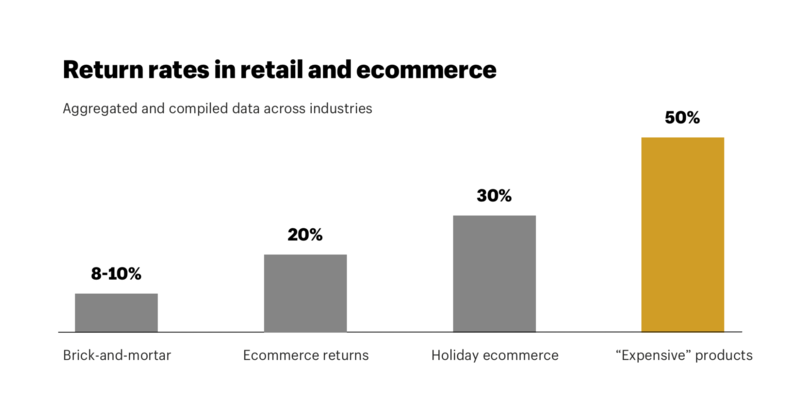 There are more people shopping on your store during the holidays, especially Black Friday and Cyber Monday. More traffic and customers means more questions. "How long will this deal last?" "When will the product arrive?" "I ordered a product 10 minutes ago, why hasn't it reached me yet?!" Ok, maybe that last one isn't that common, unless you have really demanding customers. The point is your team will be inundated with emails, chats, calls, Messenger conversations, even Instagram comments won't be spared. How do you solve this? Most companies have to hire temporary staff to cover this. So there's additional costs there. Then there are some that think they can wing it with their existing staff. Balls get dropped, customers get angry and say terrible things about you online, and your staff feels like quitting. Fortunately, Gorgias solves this problem with macros and automations. Our helpdesk app allows you to set up rules for frequently asked questions. It detects the text in a conversation and responds based on the rule you create. For example, if someone wants to know where their order is, you can have Gorgias automatically reply with their order status. Because of our integration with Shopify, we can pull the order data based on the customer's email address and insert that into the reply. No humans needed. Plus you can connect all your social media accounts, so Gorgias even automatically replies to Instagram messages! Wait, you say! Why does this make it the best Shopify app to increase sales? Well, by automating the easy questions, if frees up your team to handle live chat and other complicated support requests, which in turn helps customers buy more, and become more loyal and refer friends. Better support leads to customer happiness which means recurring sales and referrals. It's easy to set up, and we help you with creating these rules so start a free trial here. 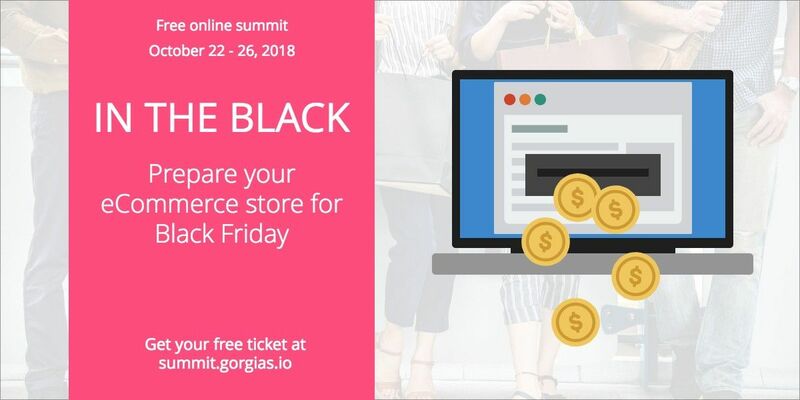 And, if you're interested in learning more about automating customer support, Romain, CEO of Gorgias, will be talking about it during the summit. Real world shopping is often a very social activity. You get together with your friends and go to stores to try out products. Studies show that we're most influenced by what our friends think and say about a brand. When we shop online, that social element tends to be missing. That's why you need Okendo, the best Shopify app to mimic that social element and showcase customer experiences. Okendo makes it easy for you to collect the things people are saying about your products and brand and display them on your Shopify store at key points. This enhances the customer experience allowing them to see your products in a social context. Through a range of user-generated content, like ratings, reviews, photos, even videos, your visitors to your store can see how others are using and loving your products, increasing the chances that they will purchase. So it turns out that 43.5% of people who purchase something during a Black Friday sale regret the decision after. Not only is that a feeling you don’t want your customers to have, it also predictably results in a higher volume of returns. This can really hurt your store. First, it’s a lost sale. On top of that, you incur expenses to handle those returns. 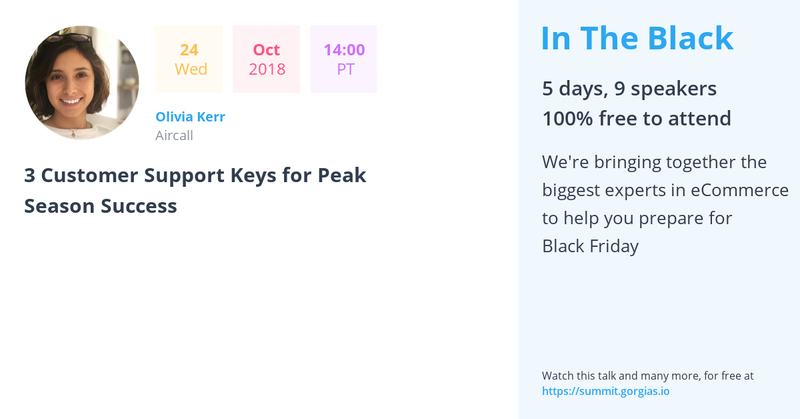 During Black Friday, with the additional sales volume, it can become a nightmare. Returnly is the Shopify app that helps you manage this process and makes it really easy to handle returns. As a retailer you can create transparent return policies and allow customers to return products without jumping through hoops. It also connects with your existing logistics systems to handle these returns at a lower cost to you and your customers. More interestingly, Returnly has an instant refund feature where customers can get a refund on their returns before sending the product back. You may think it results in fraud but it actually increases customer loyalty and results in re-purchases! Shipping is always a complicated process for retailers, not to mention the additional costs involved. With an app like Shipstation, you can simplify the entire process. It pulls in your orders from differen channels, create shipping labels, and integrates with multiple shipping carriers so that you can find the lowest rates to send your products out. Additionally, Shipstation offers a number of automation features, allowing you to create rules and workflows that increase order processing efficiency. So I may have pooh-pooh'd ads earlier in this post but that doesn't mean you should run any at all. In fact, I think every store should have retargeting ads on at all times at the very least. Retargeting becomes even more important during Black Friday and Cyber Monday when you have lots of people browsing around looking for the best deals. They may see something on your site, then go to a different site to compare prices. With retargeting ads, you can bring them back. And Shoelace completely automates this process for you. It's like hiring the world's best retargeting expert to run your campaigns, but really it's just an excellent Shopify app. 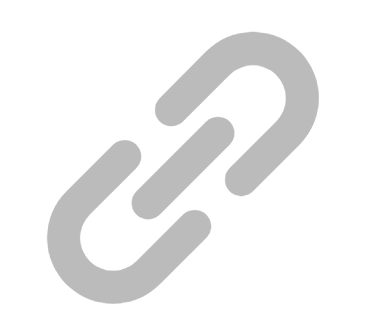 Once you plug Shoelace into your eCommerce store, it starts to generate campaigns on its own. Yup, it even suggests the ad creatives so all you have to do is approve it. Then it starts retargeting visitors based on the pages they visited and the products they're interested in. That makes it highly personalized to them. Imagine you sell all types of fashion items, from shirts to shoes. Someone visits your site to look at a shoe and then browses a competitor to compare prices. Instead of a generic retargeting ad that most stores create, your ad automatically promotes that specific shoe, reminding them to come back and purchase it. 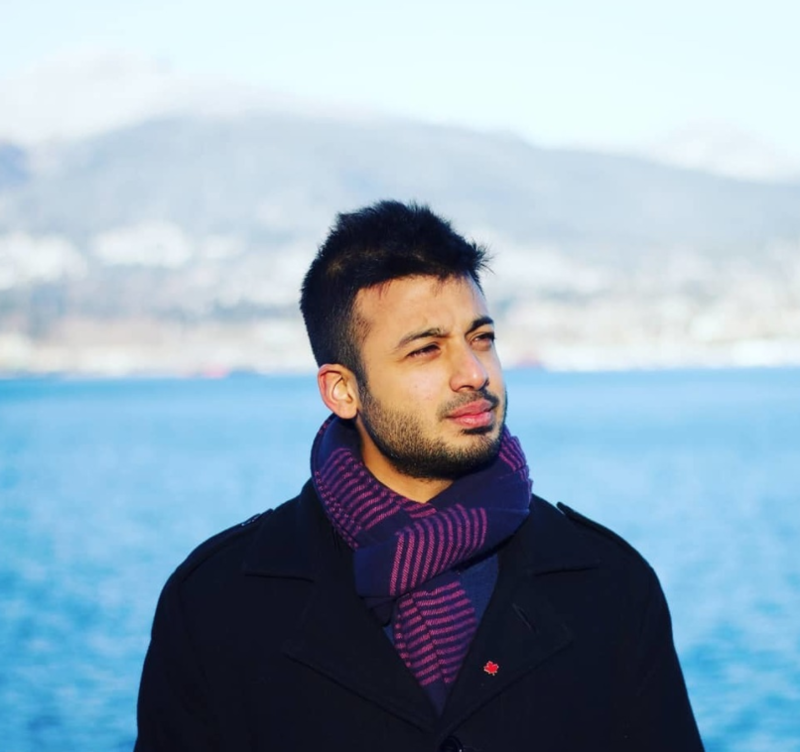 Reza, the CEO and Co-Founder of Shoelace, will talk about this in detail at In The Black. No matter how well you prepare, there will always be something unforeseen that comes up. A process breaks down, an employee calls in sick, a customer is having a meltdown. It’s important that you have enough time on your plate to handle these things as they come up, instead of getting stuck in the weeds. One way to free up your time is to list all the repetitive or mundane tasks that you and your team are doing and automate them. Anything that has to do with data transfers, synchronizing customer information, updating tags, etc., can and should be automated. With Shopify Flow, you can set up rules to do this. For example, if you want to tag a customer as high value based on their purchase volume, you can set up a workflow like the one in the image. That tag can also be passed on to your other apps, like Gorgias, so that it’s synchronized. To take it a step further, you can set up an automated ticket prioritization system in Gorgias based on tags so that the high-value customers get priority. It may seem like a little thing but even if tagging a customer in different systems takes only a minute, when you multiply that by the number of sales coming through during BFCM you could potentially save hours. And the time you save can be used to put out fires without feeling overwhelmed or dropping the ball. Watch Aaron, from Shopify Plus, explain how this work during his talk. Chat apps and Facebook Messenger have become increasingly popular in recent times. Many retails are now using Messenger to directly communicate with customers and promote products through it. Most of the time this is completely automated, but done in a way that's tasteful. How do you set this up? With Shopmessage, the Messenger marketing automation app for Shopify stores. Shopmessage automatically creates conversations with customers based on their interactions with your store. If they add a product to the cart and then abandon it, they'll get a Messenger chat asking them to complete the purchase. You can also create campaigns for past customers, promoting specific products during Black Friday. With over 80% open rates and 50% click-through rates, it's the best way to reach past customers. Plus, they have analytics, so you can see how much revenue your campaigns generated! We've talked about creating personalized promotions and providing excellent support to turn customers into loyal fans. Loyalty is powerful because it means recurring sales, rather than deal-hunters who only come by when you have a promotion. There's another way to increase loyalty - creating rewards programs. With Smile, you can make your customers feel special by rewarding them for shopping at your store. A good reward program can help you beat competitors with lower prices. With each action a customer performs on your store, you can assign points. The more points a customer accumulates, they higher up they go in the VIP list. You can create better rewards for VIP customers. For example, during Black Friday, your best customers can get the biggest discounts. Finally, you can reward them for referring new customers to you, generating even more revenue. Steve Deckert, the co-founder of Smile, will be explaining how this works during the summit. Don't miss this one! It's not easy to estimate demand during events like Black Friday. 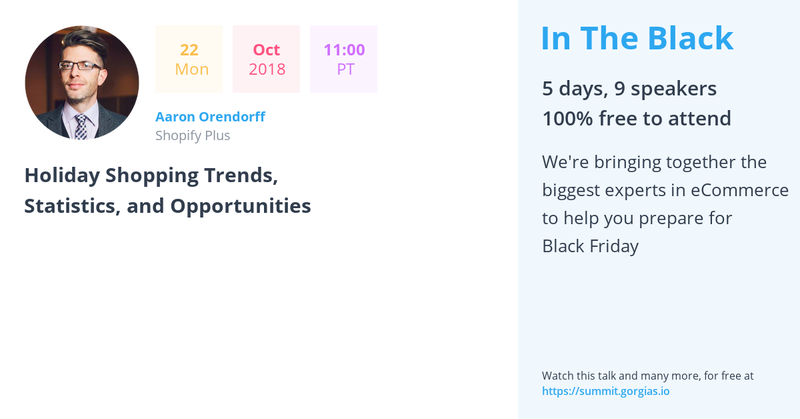 You're definitely going to see a spike in sales so that last thing you want to do is stock like you normally would and then run out during the biggest sales event of the year. With Stitch Labs, you can manage and monitor inventory and respond to quickly to any problems that occur. For example, if you have multiple distribution channels and inventory runs out on one, you can use their virtual warehouse feature to reallocate reserve stock to that channel. You can also create fulfillment workflows to automate much of your inventory management. This allows you to scale up smoothly during high-traffic days while reducing human error. Charles Michael will be joining us during In The Black to talk more about this. Speaking of inventory management and out-of-stock disappointment, here comes another great tool, Veeqo, an all-in-one Ecommerce software that allows retailers to manage and automate their entire business. 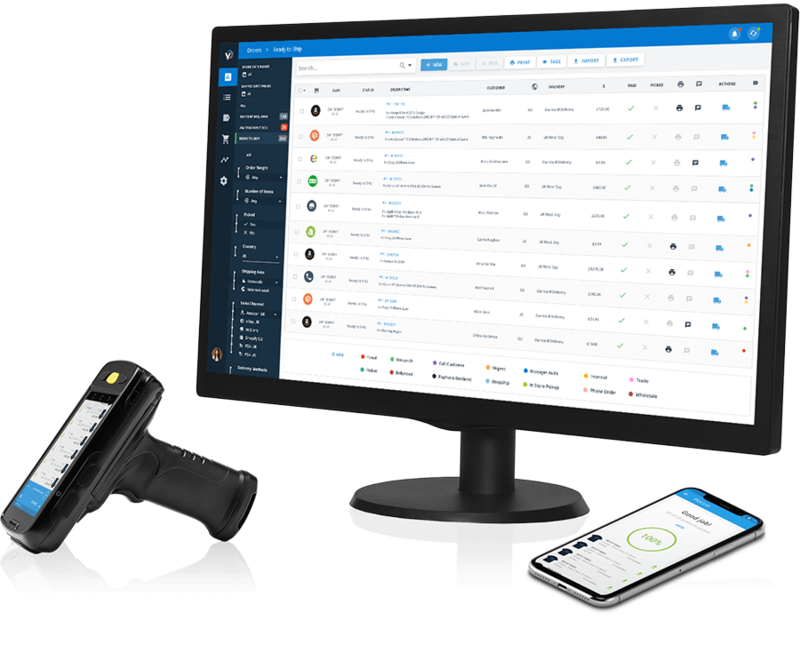 The software’s multichannel inventory management allows retailers to sync inventory across multiple stores, channels, Ecommerce marketplaces and warehouses in real-time ensuring that you never oversell again. You can view, edit and print orders taking complete control with Veeqo’s order management software. With multichannel shipping and fulfilment capabilities you can ship customer orders from any sales channel directly in Veeqo with just a few clicks. The software also includes a comprehensive Warehouse Management System with its own hardware. Here's something hard to ignore - 85% of consumers trust online reviews as much as personal recommendations. That means a good word about your products from a stranger on the Internet is as good one from your mom for most people. That's crazy! But that also means you can't ignore the power of social proof. 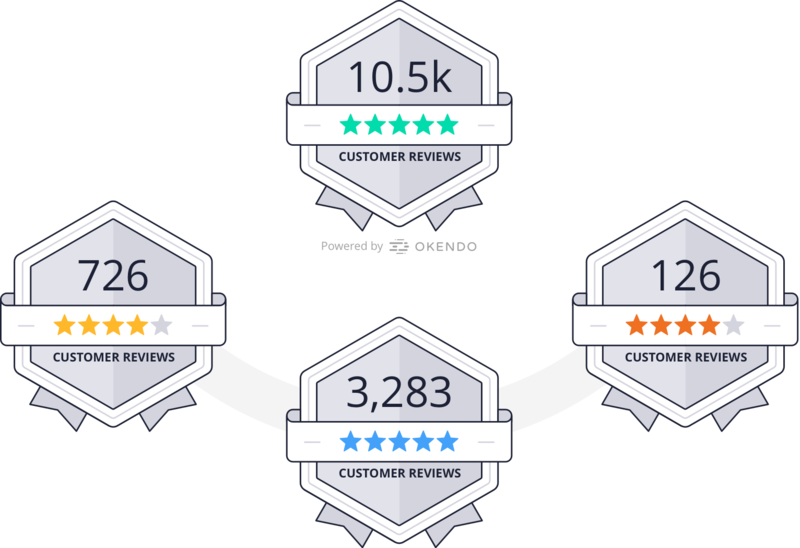 Put another way, a product on your competitor's store that has a positive review will sell more than the same one on yours without a review. Yotpo is the app you use to collect and manage product reviews for your Shopify store. When someone buys from you, Yotpo waits till they've received the product before sending them an email to review it. They make it extremely easy for customers to write a review, and that automatically gets posted on the corresponding product page. You can also add a Q&A widget to your site like the one on Amazon. In general, this type of User-Generated Content not only increases conversions, it also contributes to your SEO. Each of these apps is powerful on their own. 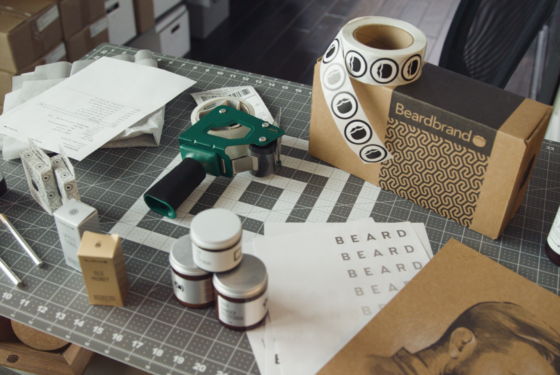 When you tie them all together with Shopify, the results multiply. 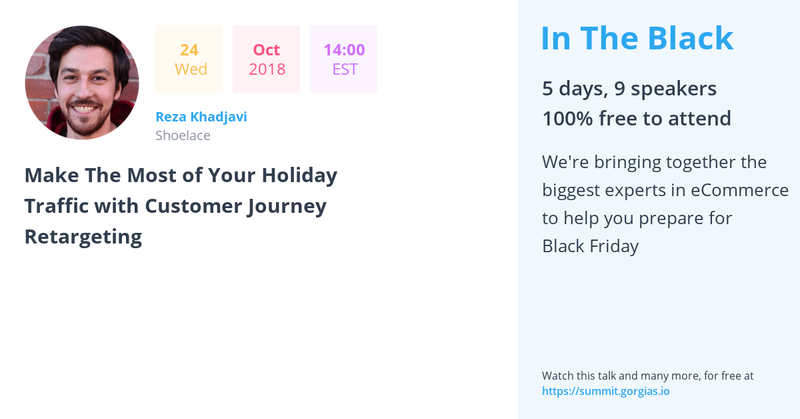 Imagine this scenario - During Black Friday Klaviyo and Shopmessage automatically create personalized campaigns. When they visit the site they purchase more because of the social proof from Okendo and Yotpo, and upsells from CartHook. If they don't purchase, Shoelace brings them back. With Aircall and Gorgias, you can provide excellent support, further increasing sales, while automating the easy questions. You don't need to worry about shipping and inventory either because Shipstation and Stitch Labs are doing the work. Finally, Smile and Returnly are building up your customer loyalty so that they come back again and bring friends with them. And, of course, it all runs on Shopify. 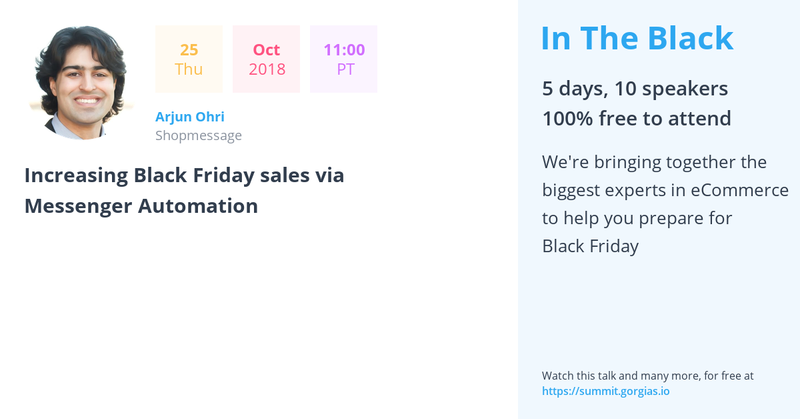 You can further automate tasks with Flow to make Black Friday, or any other day, completely stress free. If that sounds like a dream, join us for In The Black and we'll make it a reality.